For the people who live and work at Kalaupapa, the short 15-minute flight to Molokai’s topside airport is the easiest — and for some, the only — alternative to the 3-mile, 26-switchback hike up the cliffside. So for residents, it makes a difference who gets the federal subsidy to serve the peninsula’s lone airport. For the past four years, that’s been Makani Kai Air, which offers direct flights from Kalaupapa to Hoolehua and Honolulu. But with the airline’s contract set to expire in May, the U.S. Department of Transportation is taking a new round of bids, and a proposal from Mokulele Airlines to offer flights without a subsidy is concerning residents and staff. Many fear prices will skyrocket again if another airline comes in without a subsidy, Pressler wrote to the federal government on Jan. 18. Subsidized air service for hard-to-reach communities comes through the federal Essential Air Service program. Nine Hawaii communities initially made the list in 1978, though only Kalaupapa and Kamuela (Waimea-Kohala Airport) on Hawaii island have been funded in recent years. In 2011, the department selected Makani Kai to service Kalaupapa for two years, according to the airline. In 2013, the contract was renewed for another four years, from June 1, 2014, to May 31, 2018. Makani Kai offered 12 nonstop round trips per week to Honolulu and 18 nonstop round trips per week to Molokai’s topside airport. In return, the airline received annual subsidy rates of $751,040 in the first year, $730,848 the second year, $710,656 the third year and $690,463 the fourth year. Makani Kai is again proposing to service Kalaupapa for four years, this time with an annual subsidy of $650,000. The company plans to keep the same prices and seven-day-a-week flight schedule. One-way tickets on Makani Kai normally cost $138.08 from Honolulu to Kalaupapa, though Kalaupapa residents pay $72.50. One-way tickets from Kalaupapa to topside Molokai cost $72.50; Kalaupapa residents pay $42.50. President Richard Schuman said rates haven’t changed in six years. Mokulele and Alaska-based Servant Air also bid for the contract. Servant Air has proposed the same schedule as Makani Kai, with one-way tickets at $79 between Honolulu and Kalaupapa and $49 between Kalaupapa and topside Molokai. Servant Air is also proposing a subsidy of $2.9 million a year, which President and Chief Executive Officer Eoghan Joyce said would subsidize 100 percent of the fares. Meanwhile, Mokulele is proposing an initial six-day-a-week schedule, with one round trip per day from Kalaupapa to Honolulu and one to topside Molokai. The airline did not provide prices and did not respond to multiple requests for comment. On Dec. 18, the federal government selected Mokulele to provide 14 nonstop round trips per week from Hana to Kahului, with an annual subsidy of $114,099. The contract lasts from Nov. 21, 2017, to Nov. 30, 2019. But 86 people — including residents, clergy, state Department of Health staff and National Park Service workers — signed a letter of concern over Mokulele’s proposal. In addition to concerns that Mokulele could jack up prices like the now-defunct Pacific Wings once did, the letter also said that Mokulele’s limited schedule “would leave nearly 75 percent of the workers without transportation at the beginning and ending of their work week.” It would also give residents with medical appointments on Oahu fewer flight options. They said Makani Kai has carried coolers and boxes without charge, added flights for workers at crucial times and assisted wheelchair-bound passengers. They feared those services would not continue with Mokulele. “Seeing what Makani Kai has done over these past years, they have been very helpful, very courteous and compassionate with the patients,” said Sister Alicia Damien Lau, who sent the petition and letter to the U.S. Department of Transportation. Erika Stein Espaniola, superintendent of the Kalaupapa National Historical Park, wrote to the department on Jan. 12 that higher ticket prices could impact the park service’s 40 employees — not all of whom can make the hike up the cliff — as well as park visitors and researchers. Emergencies often require sending patients out of the park. “Should there be a lack of flight options from Kalaupapa directly to Honolulu, the NPS would have concerns regarding an ill or injured patient enduring an additional transportation leg topside of the island, to the Molokai Airport before reaching Honolulu,” said Stein Espaniola, adding that Makani Kai has diverted flights to Kalaupapa numerous times to transport patients. The state Department of Health has 33 employees working at Kalaupapa, spokeswoman Janice Okubo said. Of those, 29 employees signed the petition. Each year, the state pays for 343 round trips to and from Kalaupapa. Pressler said that Makani Kai allows staff access to the tarmac to assist patients getting on and off planes. 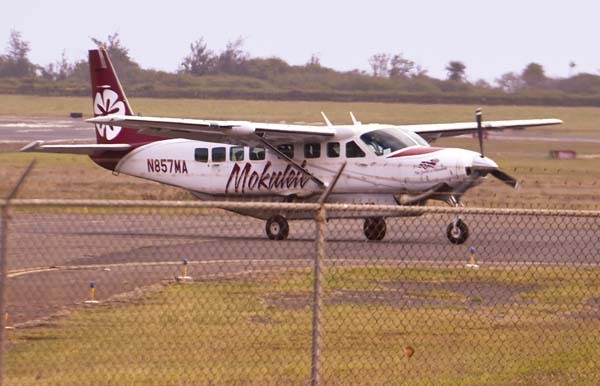 Mokulele President Rob McKinney said in a Jan. 22 letter that he was aware of the cost concerns, but that “there are no controls over pricing even if a carrier is subsidized.” He also thought Mokulele shouldn’t be penalized for the sins of past airlines. A subsidy — or lack of one — does not control fares, Schuman agreed. However, it does help Makani Kai keep prices down.